Maybe sometimes my blog posts are timely. Maybe sometimes not so much. 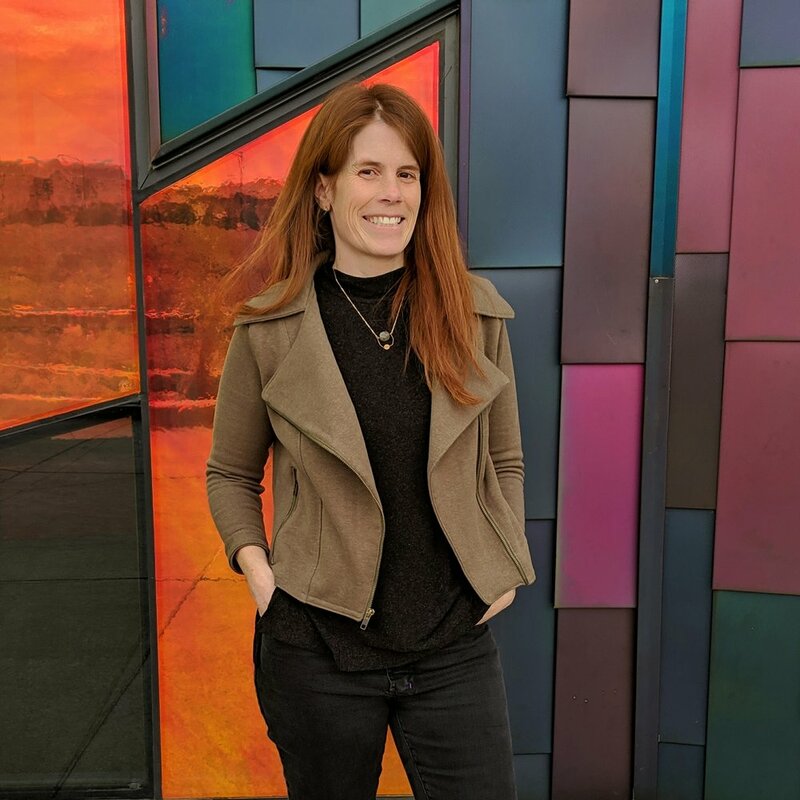 So while Leslie of Threadbear Garments released her first pattern, the Taos top, back in late January and I’m just getting around to blogging about my experience testing the pattern now. 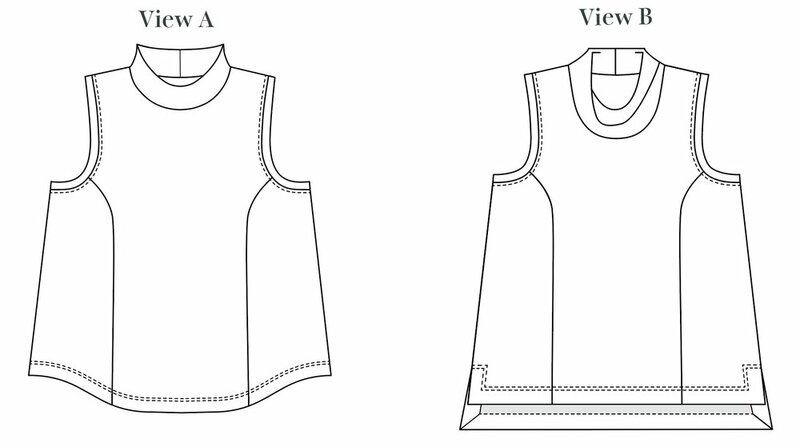 Taos is a sleeveless, paneled top with 2 interchangeable necklines and 2 hem options. 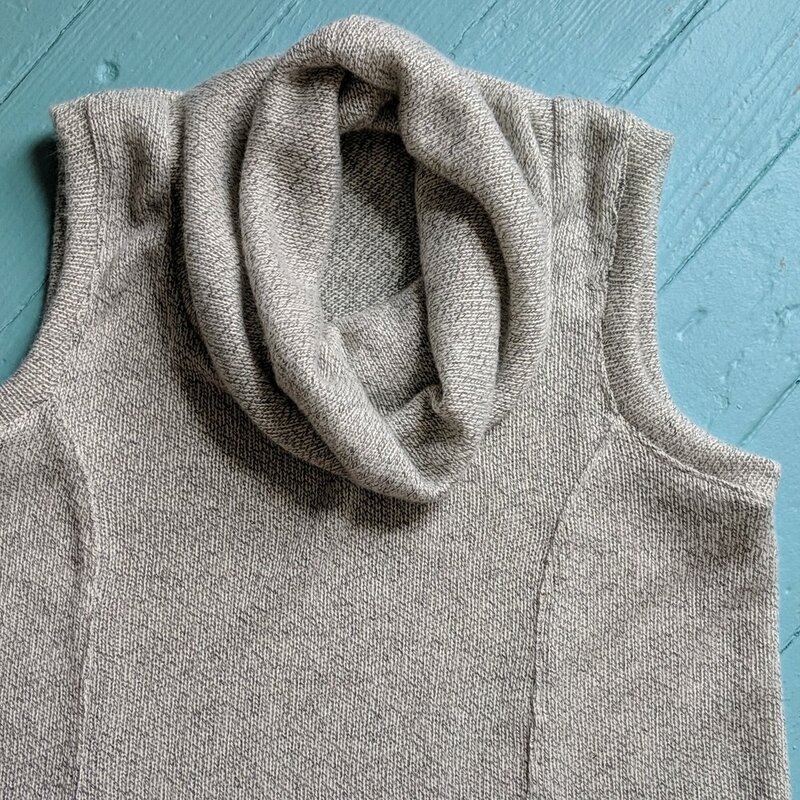 I made my first cowl neck version out of some dreamy designer overstock sweater knit I rescued from LA Finch Fabrics’ End of Bolt section. Initially I made size 8 as per the body measurements chart. 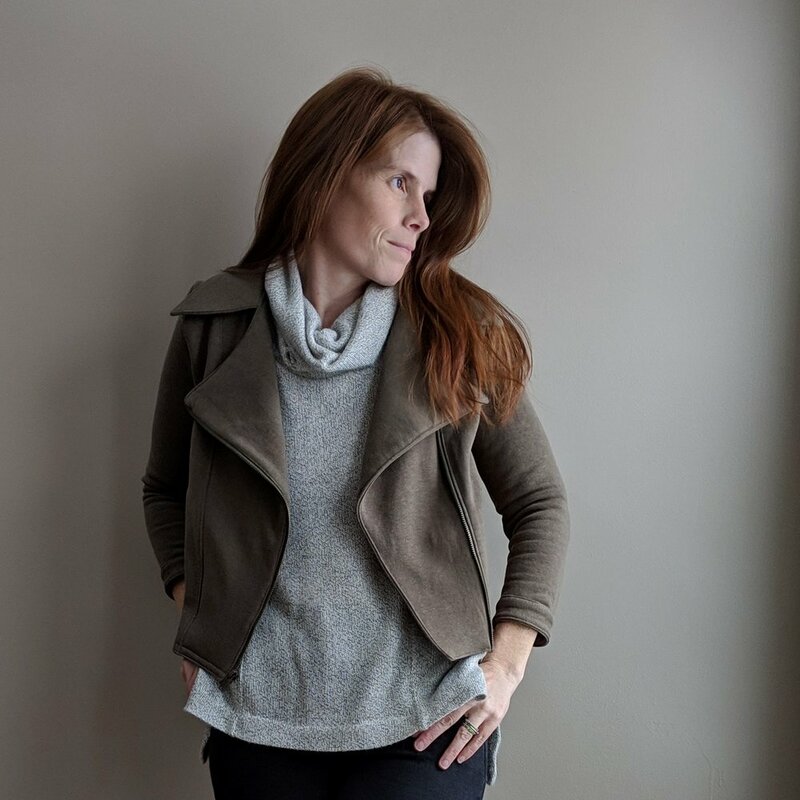 I was somewhat concerned about how I’d style a sleeveless top in the winter, but I quickly discovered it’s a really great layering piece, and I often wear it under my favorite Evergreen jacket. I sent the scraps of this sweater knit to Jen and she made a matching Taos for twinning!! Read her post here. 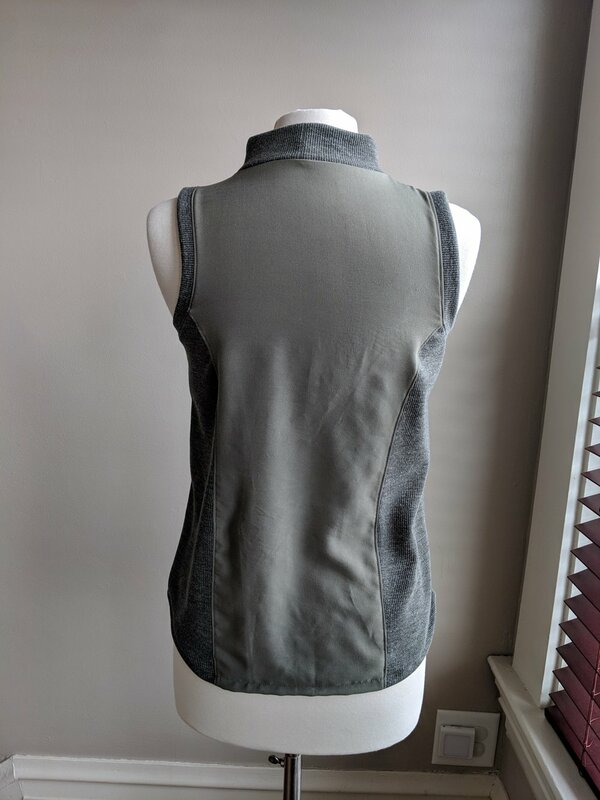 Anthropologie is frequently a source of inspiration for my sewing, so after coming across this sleeveless, vented hem sweater, I needed to make another Taos. This version is a combination of Joann pucker knit and a burnout. I like to wear it under my denim coveralls. With just a half an inch of negative ease at the bust, I knew I could try making a Taos with a combination of woven and knit fabrics without sizing down. With exactly a half yard of rib knit from Harts, I was able to squeeze out View A. The center is olive rayon challis (leftovers from this project). I simply lengthened the armbands and neckband to 100% so that it wouldn’t be stretched over the challis, causing puckering. I wish I had some modeled pictures of this version to share with you. But I didn’t feel like editing my, let’s call them…. apex prominences… out of the shots I took. You’ll just have to settle for Tina’s still lifes. (I very rarely have to edit her nips out.) I would have preferred to have the woven panels at the sides, but the length of rib I had wasn’t long enough to fit the center panel. At any rate, consider this my blessing to try Taos in a combination of fabrics. It makes a great scrap buster in that case! It just so happens that right after testing for the Taos concluded, I found myself in Kansas City. And KC happens to be where Leslie lives, as well as my BFF, Kate. I’m wearing a Taos under all those layers, for obvious reasons. Kate obliged me with taking some pics around KC. The Museum at Prairie Fire was incredible, albeit rather cold because JANUARY. My final version was made from D&H Fabrics’ black wool jersey. As this fabric was rather stretchy, I was able to size down to a 6 here. Tina is modeling again because I often pair this Taos with my Evergreen too. I also brightened these pics so you could see the lovely seam lines. This was my first experience sewing wool jersey. I’ve got to say I was surprised that it’s not scratchy in the least and is quite warm. I highly recommend trying some if you haven’t before. More chilly KC. Pardon the wrinkles. My duffel bag did that. Leslie’s pattern impressed me right off the bat. The PDF was very well organized and professional. She certainly set the bar high and I look forward to seeing what other designs she has up her sleeve.